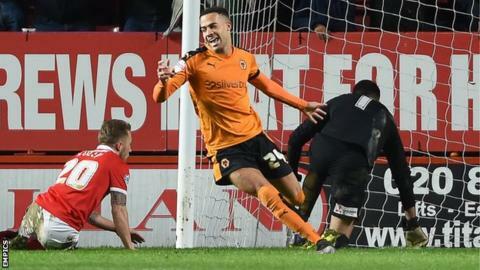 Jordan Graham's first senior goal helped Wolves earn a straightforward victory against Charlton at The Valley. The 20-year-old reacted quickest to a scramble in the box just after the break to fire the ball past goalkeeper Stephen Henderson. Graham's late corner was met by captain Danny Batth, whose effort towards goal was deflected in by defender Harry Lennon to double the lead. The Addicks only had two shots on target in a 13th defeat this season. Wolves striker Benik Afobe's scuffed shot was the only effort on target from either side in a first half, which ended shortly after a collision between Charlton substitute Simon Makienok and referee Keith Hill. The start of the second-half was delayed by 10 minutes as Hill had to be replaced, but the visitors threatened immediately as Graham curled the ball narrowly wide of the post after a quick break away. Moments later Afobe turned Lennon, cut the ball back from the right byline and into the path of his midfield team-mate, who had the simplest of tap-ins. Charlton struggled to win enough of the ball and took until the 71st minute to manage their first effort on target, but Makienok's header was easily saved. With seven minutes of play left, the impressive Graham was once again involved as his inswinging corner caused mayhem and led to Lennon's own goal, which ensured Wolves secured back-to-back victories. It was a fourth defeat in eight matches for the home side - who are now only two points above bottom-of-the-table Bolton. "Focusing on the negativity won't help the players. As staff, we have to focus on what we must improve on. Nobody is happy at the situation which we are in. "It was a tight first half, the second half we were at times less sharp in both boxes - defensively as well as offensively. "We got punished for that. Wolves have the players with pace and technique to hurt us." "The first goal was pivotal, the first half there was once chance for Afobe who took it on his chest. "The second period we got the first goal, which in the Championship is big, and that is the fifth game on the trot that we've got the first goal. "After that we managed the game very well, and I am delighted to see that second one go in. Defensively we negated Charlton. "We've been waiting for Jordan Graham to get that first goal, he's capable of cutting inside and shooting." Match ends, Charlton Athletic 0, Wolverhampton Wanderers 2. Second Half ends, Charlton Athletic 0, Wolverhampton Wanderers 2. Attempt blocked. Ricardo Vaz Te (Charlton Athletic) right footed shot from outside the box is blocked. Assisted by Chris Solly. Substitution, Wolverhampton Wanderers. Sheyi Ojo replaces Jordan Graham. Attempt missed. Cristian Ceballos (Charlton Athletic) left footed shot from outside the box misses to the right. Assisted by El-Hadji Ba. Own Goal by Harry Lennon, Charlton Athletic. Charlton Athletic 0, Wolverhampton Wanderers 2. Corner, Wolverhampton Wanderers. Conceded by Stephen Henderson. Attempt blocked. Nathan Byrne (Wolverhampton Wanderers) right footed shot from the right side of the box is blocked. Assisted by Matt Doherty. Substitution, Charlton Athletic. Cristian Ceballos replaces Morgan Fox. Tareiq Holmes-Dennis (Charlton Athletic) wins a free kick in the defensive half. Jordan Graham (Wolverhampton Wanderers) wins a free kick on the left wing. Attempt saved. Morgan Fox (Charlton Athletic) left footed shot from the left side of the box is saved in the top left corner. Ricardo Vaz Te (Charlton Athletic) wins a free kick in the attacking half. Attempt blocked. Jordan Graham (Wolverhampton Wanderers) right footed shot from the left side of the box is blocked. Assisted by Kevin McDonald. Attempt saved. Simon Makienok (Charlton Athletic) header from the centre of the box is saved in the centre of the goal. Assisted by Morgan Fox with a cross. Attempt missed. Harry Lennon (Charlton Athletic) right footed shot from the centre of the box is close, but misses to the left. Assisted by Simon Makienok with a headed pass following a set piece situation. El-Hadji Ba (Charlton Athletic) wins a free kick in the attacking half. Corner, Charlton Athletic. Conceded by Ethan Ebanks-Landell. Corner, Charlton Athletic. Conceded by Matt Doherty. Substitution, Charlton Athletic. Tareiq Holmes-Dennis replaces Reza Ghoochannejhad. Corner, Wolverhampton Wanderers. Conceded by Morgan Fox. Delay in match Stephen Henderson (Charlton Athletic) because of an injury. Attempt blocked. Reza Ghoochannejhad (Charlton Athletic) left footed shot from the centre of the box is blocked. Attempt saved. Benik Afobe (Wolverhampton Wanderers) right footed shot from outside the box is saved in the bottom left corner. Assisted by Dave Edwards.